It’s been a week, folks. One, crazy, exciting, heart-warming, bittersweet and frustrating week. Sunday, we celebrated Adelaide’s birthday among friends, family and caregivers. Sunday evening we were inspired by artists who happen to have epilepsy at The Kant Institute’s “1:26 Art in Epilepsy” art show where Miguel and I were honored for our work in the epilepsy community. 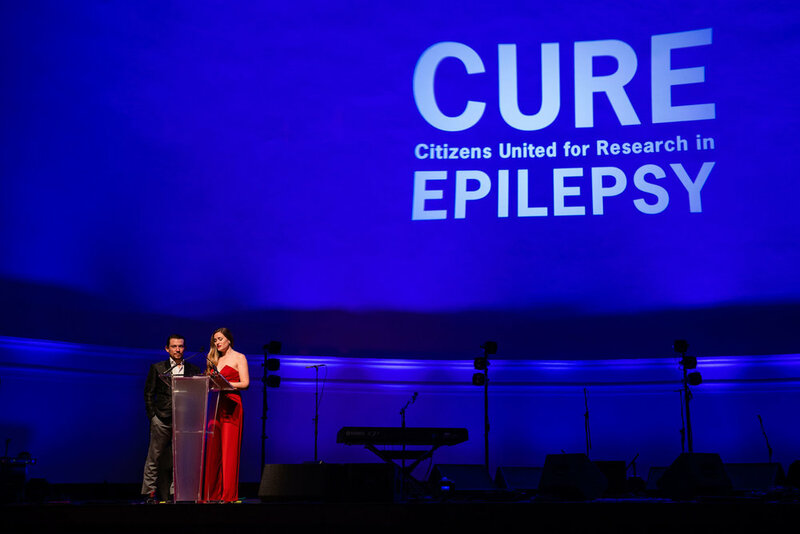 Monday night was CURE’s 20th anniversary benefit and it was a night to remember where over 2.3 million dollars was raised for epilepsy research. Wednesday was Miss A’s actual birthday and by noon we were in the ER after she had four back-to-back seizures that morning. Her doctor recommended an inpatient stay so that we could adjust her meds more quickly. Not how we had planned to spend her birthday but for a moment I was grateful that she wasn’t cognizant enough to know what day it was or even what a birthday is. In lieu of a traditional post this week, I would like to share with you the speech I wrote that Miguel and I delivered to the 1,100 attendees at CURE’s Monday night benefit. As soon as I have a copy of the video I will post in the media section on my site. Last year’s speech can be viewed here. Kelly: I recorded that video of our son Jackson with Miguel this past Spring. It has now been a year since we have seen Adelaide smile. With that in mind, I’ll admit I had a tough time writing our remarks for this evening. I wanted to fill everyone with hope with a story of progress but that’s not our truth. We stand before you even more desperate than we were when we spoke on this stage last May. More than a year has gone by since that benefit when we shared the epilepsy journey we had begun with our baby girl, Adelaide. That baby girl turns three on Wednesday and she is still having seizures nearly everyday. Since last year’s benefit she has been on six different anti-epileptic drugs, spent more than a month’s worth of nights in the hospital, had in the vicinity of 1,000 seizures, and we have watched as trauma teams resuscitated her…twice. Miguel: Adelaide has also lost her ability to hold objects for longer than a few seconds, breathe without oxygen support, make lasting eye contact and, as you heard from Jackson’s song, probably the most devastating: she no longer smiles. We have fallen into a pattern of one step forward, two steps back. Is this because of the seizures? Maybe the meds with life altering side effects? No one knows for sure but we watch everyday as our daughter slips a little further away from us. We watch videos from a year ago and remember how distraught we were then over her lack of development. And now, there is nothing we wouldn’t give to have that little girl back in our arms. Kelly: Desperation is a funny thing. It can break you or it can fuel a determination inside that you never knew existed. Sometimes, as I’ve learned all to intimately, it can do both concurrently. It is desperation that brought Susan and the other founding CURE mothers together around that kitchen table 20 years ago and it is that desperation that fuels our family today as we continue their fight. We try another treatment, another med, conduct another test, schedule another clinic visit but there is only so much we can do to help Adelaide. During a seizure I hold her and tell her that she is safe, that its going to be ok, that Mommy loves her and is here with her. I have no idea what she is experiencing because she can’t tell me and it breaks my heart that I can’t tell her that the seizures will never happen again. Because I know tomorrow she will probably have another. I am her mother and I can’t protect her - but I can fight like hell for her. Miguel: Epilepsy research remains largely underfunded in comparison with other neurological disorders. Epilepsy affects 43% more people, than Parkinson’s, Multiple Sclerosis, Muscular Dystrophy and Cerebral Palsy combined. Yet, it receives 60% less funding than the other neurological diseases. But statistics don’t matter to a parent whose child is suffering and all they want is a doctor to say they know how to fix it. THIS is why CURE’s work is so important to us. No one else is going to fund the research our daughter so desperately needs. And no other parent should have to hear that there is no cure for epilepsy. Kelly: Take a good look at us standing before you. Two parents pleading for a better life for our daughter and for our family. Desperate for a day when we’re no longer on the lookout for a life-threatening incident. We will not give up and we won’t let you give up either because as Caroline said in the video: “You keep fighting because you’re stubborn as hell.” Epilepsy awareness and research IS further along than it was 20 years ago. Progress HAS been made. It is not nearly enough but the ball is rolling and that is largely in thanks to CURE. Yet tens of thousands of people still die of epilepsy-related causes each year. Tens of thousands. So, we are fighting to keep our daughter alive but we cannot do it alone. We need science to catch up to Adelaide and we need all of you to help.